My suffering is grateful to you and your understanding. This profound lesson has given me purpose and unearthed the treasure around me. I’ve held your words so closely to each conversation. An extraordinary guide, with a lantern, and provisions for the heart of me and my everchanging companion. The terrain although craggy is rendered passable by the surefootedness of your teachings. Thank you for each selfless, loving step that we were able to take with you. Thank you for holding my needful hand, fiercely. Such an inspirational, powerful, and peaceful warrior. Go unfaltering as you have lived and expound the love waiting for us on the other side with the final unending stroke of your masterpiece. While we do our part in your ongoing installation that strengthens the waking world in a wave of illumination. 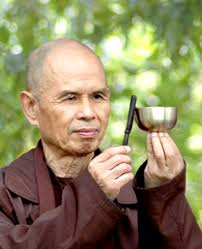 Please light a candle and send prayers of comfort and gratitude to Brother Thay during his transition.